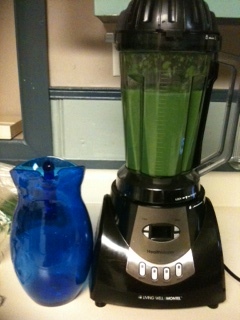 Green drinks are a crucial part of any healthy nutritional environment. Generally speaking, the primary healthy ingredient in these green concoctions is green leafy vegetables; the most nutrient dense things on earth. 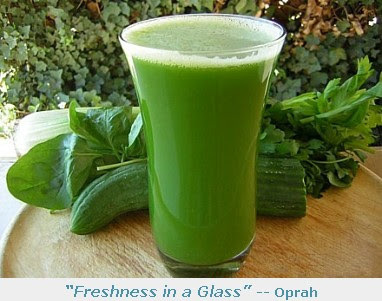 As a result, a green drink is pretty much the healthiest thing that you can ever wish to put in your body. Another advantage of a green drink is that it is very alkaline and serves to neutralize the excessive acidity that our unhealthy modern diets cause in our bodies. This property of a green drink also becomes especially helpful after some vigorous exercise in order to neutralize lactic acid which formed in the muscles. I always have a glass or two after a training session. The trick to making a green drink a permanent part of your healthy nutritional environment is to make sure it is always readily available. And the best way to do this is to prepare it in bulk and freeze it in smaller containers to be defrosted on demand. It can keep in the freezer for a very long time and, once fully defrosted can keep in the fridge for about three days – just long enough to be convenient and just short enough to force you to actually drink at least one glass per day. Slice up a cucumber, two apples, a stalk of celery and a about 2 cm of peeled ginger root. Put all of this in a blender together with two big handfulls of spinach, the juice from one lemon and just enough orange juice to get the blending process started. Start up the blender and proceed to cut up the vegetables for the next batch. By the time you are done cutting the next bunch of vegetables, the blending should also be done. Pour the contents into some freezer containers and load in the new batch of ingredients. Repeat until all your vegetables are blended. I usually make this recipe four times which lasts me between 2 and 3 weeks. The green dink resulting from this recipe is too thick in consistency for me to drink and I usually dilute it by half with orange juice. Try to get minimally processed juice and be sure to look after your teeth well when drinking lots of orange juice. Personally, I find the taste of this green drink quite pleasant. The biggest thing to get used to is the consistency. To be honest, all of those solid pieces were pretty hard to swallow at the start. If you really have a problem with the solids in the green drink, cut down on the celery since this is where the majority of the solid pieces come from. You can also use a juicer instead of a blender, but this will remove some of the health benefits. You will probably need some time to get used to this green drink, but I guarantee that it will be endlessly more beneficial to your health than all of those other tastes we so diligently acquire (beer, whiskey, cigarettes etc.). Acquire the green drink taste. It may very well be the best acquisition you ever make.